There are many hidden treasures throughout Northeast Ohio. 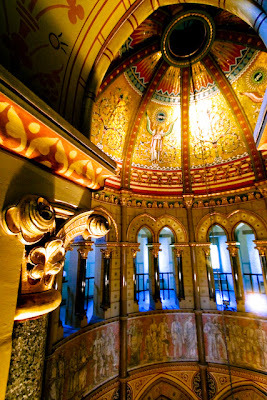 This beautiful and colorful rotunda can be found in President Garfield's Memorial in Lake View Cemetery. Those ugly cloud streaks...I could love them. The skies show us graphic reminders of the innumerable plane flights taking off and landing every day. For most people the condensation streaks are simply a reminder of the expansion of air services over the last decade. For photographers it can be either an uncontrollable irritant or a welcome addition to their craft. Let's look at these two similar pictures. 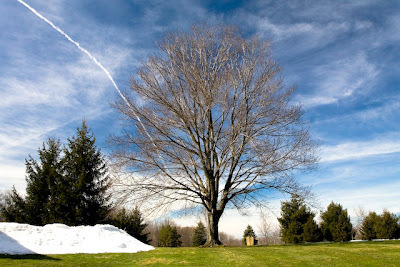 Most photographers will say the perfect outdoor sky would have blue sky and white, fluffy clouds. Some will actually shoot clouds and sky and later "photoshop" them into their pictures that have bland skies. The picture above has a pleasant blue sky and soft white clouds. But these clouds were actually formed by the jet vapor streaks! Over time they disperse and may form pleasant linear patterns. This is similar view taken a short time later. Now there are well-defined jet vapors criss-crossing the sky. Air traffic runs in lanes much like car traffic. These air lanes are in the sky and are consistent and regulated. Since I live near a highway (I-422) we can see distinctive vapor streaks every day. These flights are part of the westbound approach to Cleveland-Hopkins that you see when you sit at a ballgame in Jacobs Field or from I-480 near I-77. The vertical streak running from the upper left corner of this frame comes from a northbound jet about to make a big turn in order to drop into the Hopkins landing lane. It will be awhile until the vapor cloud disperses leaving an unnatural-looking cross-hatched cloud pattern. The dilemma for photographers is that they are at the mercy of these patterns from jet vapors. Sometimes the streaks are beneficial but usually it means the appearance of an unnatural element in their photographs. Or, even worse, lots of "photoshopping" in order to clean them up. As you might expect, Flickr has a group dedicated to Vapour Trails. Enjoy! 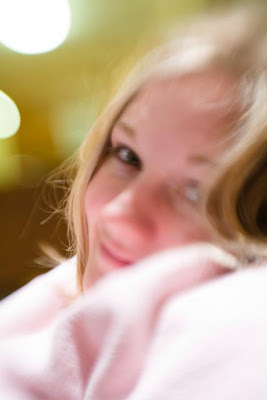 This is a picture of my daughter Jessica using the LensBaby 2.0 lens (Wiki). It softens the focus so you only have a slight range or area of the photo which is somewhat in focus. It's great for face shots or isolated objects. As you can see the "bokeh" factor is perfect. You need to experiment to get the hang of the LensBaby and shoot multiple shots to get the selective focus you want. Often, you think you got a great image on the camera's display only to find it's too blurry at full screen. Here is a link to some of my earlier LensBaby images. You can check out tons of these kinds of images at Flickr LensBaby Group. Enjoy! 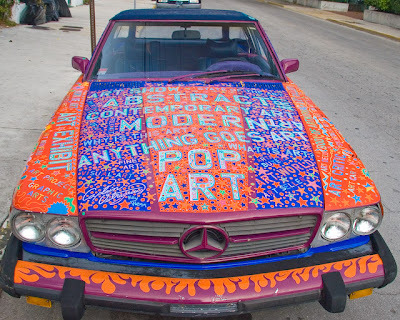 If you aren't sure what to do with the old Benz here's an idea. This is Captain Outrageous' car. He's a local art dealer in Key West. Nice promo. Don't you just love finding these old relics? 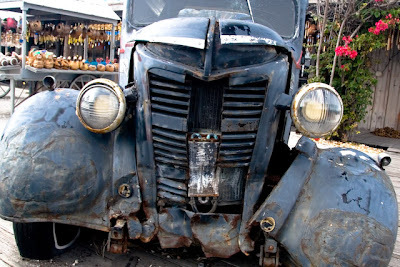 What is it about old, decaying cars, barns, trains, boats, etc. that we find so irresistible? Yet we are sometimes repulsed by the aging of man. Weird. 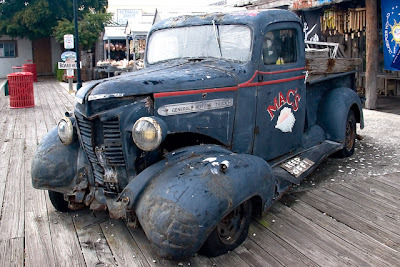 I found this GM pickup truck at the pier in Key West. The salt air is doing quite a number on the metal. I don't think this one will make it to the restoration barn. Get low and use that wide angle lens! This was shot at 17mm. The sky was overcast which made the lighting rather flat but even. I punched up the colors in Lightroom. I am working more with conversions to b&w. In the old days....pre-1995....if you wanted to shoot color you loaded E-6 film into the camera. If you wanted black 'n' white you loaded Tri-X. Gosh, that sounds so ancient nowadays! Today, it is so easy to do both at once. Anything you shoot digital can be converted to b&w using any photo editing software. Even the camera will do it for you. In fact, many cameras will shoot in sepia tone for you if you set it right. The trick is to select the right images to convert. If the colors are important to the pictures then stick with color. But if the composition is right and the textures and imagery are interesting without the need for color, then you may have a great b&w waiting for you. 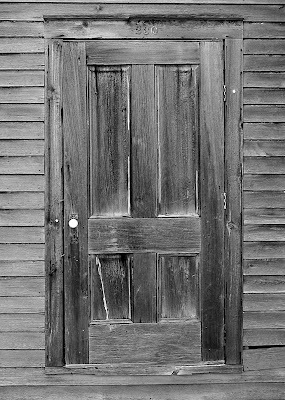 Here's an example from a wooden door in Key West, FL. Enjoy! I will post a color version of this next. 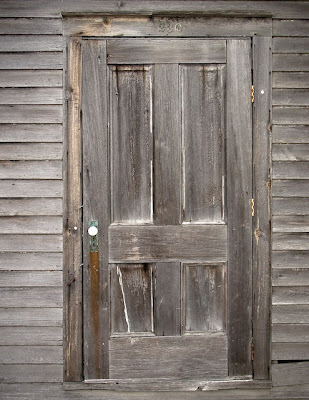 Grey weathered door in color! Here is the original image in color. The color adds characteristics to the image that aren't apparent in the b&w. Note the rusty, green door handle. The minerals from the door handle have oozed down the door creating a brown stain. Either way, color or b&w, an image can have appeal if the composition and characteristic are interesting. While battling with Blogger over their goofy picture loading system I managed to get a few new ones in the tank. 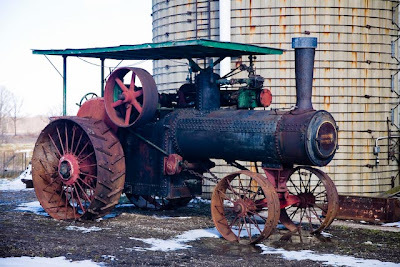 Here's a beautiful antique tractor I found sitting out in the yard off of Rt 528 in Middlefield, OH. Just needs to be restored. Enjoy! I shot this with my new Canon 5D camera. It is awesome. I loved my 20D but now I have a full frame sensor and the new lens optics are killer. Spring is finally here and I'm itching to shoot. Just give me those big white fluffy clouds and blue skies! I am still moving some picts to my flickr account but I'll post more here soon. 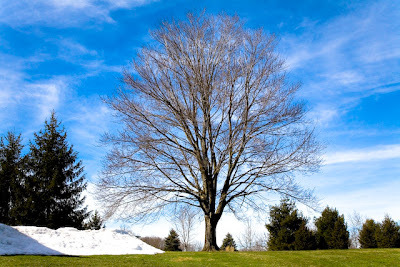 I have a ton of new images to show but Blogger has removed BloggerBot from Picasa. This has made it nearly impossible to upload pictures. I'm looking for a workaround. Cavs vs. Lakers LeBron outdoes Kobe. Cavs vs. Heat LeBron gets after his buddy Dwyane!